It’s a bit lonely... there are no team members yet. After qualifying from Onderstepoort (University of Pretoria, South Africa) I was conscripted into the army. The army seconded me to work as a vet in a very rural area called Thaba'Nchu (in the middle of South Africa). I was well and truly thrown into the deep end! With the help of animal health officers and meat inspectors I had to run and work in a small animal clinic, look after the welfare of 10000 cattle spread over about 20 rural villages, treat horses at the local stables and supervise meat inspection and animal welfare at the nearby export abattoir. It was a challenge I relished and after my army service period ended I stayed on for another five years. After this the opportunity came (via my best man) to work in Suffolk with the view to stay a while and travel. Well instead we fell in love with East Anglia and had four children :-). I have also accumulated various waifs strays which makes travel (especially for more than a week or two) a little more difficult. My research into an area to start a practice identified Wangford as an area where unusually large amounts of dog food was sold! Of course there was also a large empty office block available and everyone we spoke to agreed there was a need for a vets here. It was settled; Wangford Veterinary Clinic was born in April 2002. Since then we have grown into a flourishing, caring small animal practice. We have gathered together a team that is caring, compassionate and professional. Every team member cares about the work we undertake to ensure the best outcome for our patients and clients. We constantly ensure we keep our skills up to date. We pride ourselves on listening to our clients, giving personal attention and care to each one, getting involved in local community, supporting various local and national charities, Our largest event is Strutt Your Mutt Dog Day and Walk, an event where we raise money for charity by celebrating the special relationship between people and their dogs. We were very proud to be voted England's representative to the Petplan practice of the year 2015 award (The other two practices were from Scotland) We certainly have the best clients and patients in the world! Boris graduated in 2010 from the Trakia University of Stara Zagora, Bulgaria. 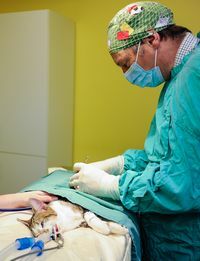 He has worked his entire career in the UK and in 2012 joined the team at Wangford Vets. Surgery, emergency and critical care, are some of his special interests with this being an important part of our 24//7 out of hours emergency cover service. Away from work he enjoys photography, running and spending time home with his wife Sonya cat Shira and dog Kobi an Alapaha Bulldog whom he re-homed. He likes to go back to Bulgaria in the hot summers to visit family and practice water sports such as snorkeling and spear-fishing. Vicki decided she wanted to be a vet at the age of nine, she qualified in 1990 from the Royal Veterinary Collage in London and has worked in East Anglia ever since then. 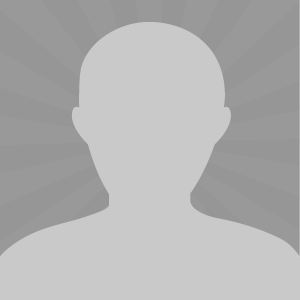 She enjoys the variety of general practice, with a particular interest in surgery. Outside of work Vicki has three children and many animals to keep her busy. She also enjoys reading, cooking, Kayaking and holidays in France. We are pleased to announce Vicki is now working three days a week with us. Catherine has lived and worked in Suffolk for 10 years, since qualifying from Edinburgh University in 2006. She started working with Wangford Vets in March 2014 to offer a veterinary service for exotic pets (Suffolk Exotic Vet Services). In October of 2014 she joined Walter and Boris to work in the practice now ( 2017) Catherine having just returned from maternity leave with her little boy and now runs clinics for exotic pets in the practice on Tuesdays. She also takes part in the our of hours rota and occasionally when one of the other vets is on holiday. 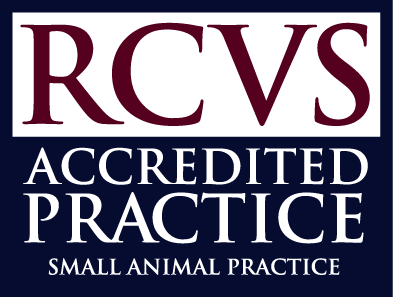 In 2015 Catherine completed a post graduate certificate in exotic animal medicine called the certificate Advanced Veterinary Practice and she is now an RCVS recognised advanced practitioner in exotic animal medicine. Catherine has a retired greyhound called Daisy and a snake called Barry. These days she spends most of her time at home entertaining her toddler. But when she time she enjoys sewing, salsa dancing and walking around Suffolk’s beaches and countryside with Daisy. Charles has recently joined us to help the practice as it grows. He loves all animals from Exotics through to Equine and Farm animals. 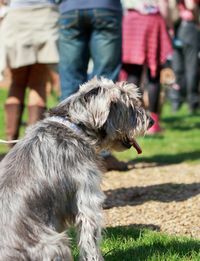 He breeds and shows Lhasa Apso dogs and has enjoyed much success with them. He currently has 2 at home, Poppins and her daughter, Lady. Charles lives with his wife, Tanya, and their 3 children Frederick, Lacey and Ronald. He has a lot of experience with exotic rodents and reptiles and has also helped rescue, rehabilitate, retrain and re-home hundreds of dogs over his lifetime, which shows in his passion for every dog being given a chance. 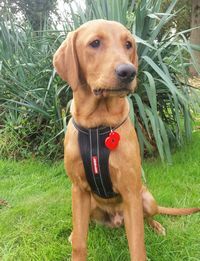 Like most of our staff Jill has a menagerie at home, comprising of two black labs, Poppy and Cara, Ted a gorgeous fox red lab and latest edition, Elsa, also Fox Red who is a real sweetheart and Lola a beautiful but very naughty Beagle. Jill enjoys taking Ted and Elsa to dog training each week. In addition to the dogs she has six cats, all strays or rescues brought home from the practice over the years and a collection of turkeys and chickens. Jill has worked at the practice since 2007 and does all our marketing, fundraising and PR as well as customer care. Estelle is a registered veterinary nurse who qualified from Berkshire College in 1992 and has worked in practice since 1988. She has always lived locally and has twin teenage daughters, Beth and Lauren. Following in Estelle’s footsteps they are both madly into animals, Lauren with a real love of horses, successfully competing on her own horse, hopes to have a future in equine veterinary care. They both take a keen interest in what’s going on in her day to day work, always wanting to know what cases she has dealt with and on numerous occasions helping to rear orphaned pets. Her own dog is a very docile lurcher named Torres who lives happily alongside their extremely soppy house rabbit, Lilo. Estelle has worked here at Wangford Veterinary Clinic since 2008, working alongside her own business providing nursing in clients’ own homes. 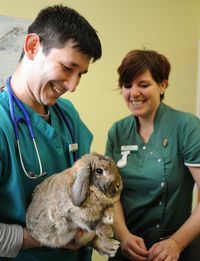 She says that her job has always been one of her great loves in life, reassuring the animals when they come in to visit whether for a quick consultation or as an inpatient. She tells us that the satisfaction she gets from nursing a sick pet back to good health is something one simply cannot explain. Steph was born in Wangford and has lived here all her life. Her dog Oki came in for his first injections when the practice first opened. She came to us for work experience in 2009 and has worked her way up to become a qualified veterinary nurse. Steph and her boyfriend Jack have just got themselves the cutest little Border terrier puppy you ever did see – they have called her Peggy and you may see her from time to time when you visit the practice. She loves baking cakes and makes everyone’s birthdays taste better. She has a keen interest in animal welfare, animal physiotherapy and enjoys sharing her knowledge with clients. In Susanne's spare time she enjoys going to the cinema and walking. Jazz is our nursing assistant, she says she enjoys her job very much and says she has definitely found the right job for her. Jazz loves all the kittens and puppies that come into the practice and is always up for a cuddle with them. She is currently fostering the cutest kitten called Mia and she hopes to foster lots more in the future. Sarah has worked for the practice since joining the reception team in 2008 and gained her SQP qualification in 2012. At home she has two dogs, Charlie and Mabel, two cats and one rabbit – all rescued. She lives in Halesworth with her partner and daughter and when not working enjoys reading and gardening. Louise has been working as a receptionist here since 2009 but her husband wishes she worked somewhere else as she is always taking new pets home! At the moment she has two black Labradors, four cats and a pig, Percy who is a bit of a pest but she loves him. Louise lives with her husband Carl and 16 year old son Sonny. She also has two step children who visit regularly, keeping her very busy. When she isn’t working Louise and her family enjoy camping or caravanning with the dogs. (She wishes she could take the cats but there isn’t enough room). What Louise likes best about her job is seeing puppies and kittens coming in for their first vaccinations because she can sneak in a quick cuddle. Jodie recently joined the team and tells us that she believes she has found her dream job, meeting different pets and their owners daily. She has a scruffy terrier called Tilly who is obsessed with her tennis ball and her most recent edition a kitten belonging to her daughter Jazmin. She says that she had forgotten just how mischievous a kitten could be and that nothing in her house is safe anymore! After reading the team profiles Jodie’s husband is more than bit concerned as to how many pets she may be taking home in the future. Claire joined the team in May and believes she has found her dream job, seeing all the different puppies coming in and out of the veterinary clinic and sneaking a quick cuddle with them. Claire lives with her son Louis and her golden retriever Sam, who loves going for long walks on the beach and in the woods. They also have two guinea pigs called jess and Ginger, they are very vocal but very cute. Having lived in Suffolk all her life, Claire enjoys long walks and bike rides with her son in our stunningly beautiful countryside. Rachael is married with 3 teenage children, also 3 cats and an extra one that she is currently fostering for the Cats Protection League. 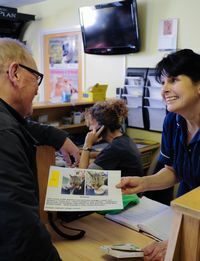 She says that she enjoys working at Wangford vets as every day is different , the customers are friendly and she enjoys all the cute animals that come through the door is never ending. In her spare time Rachael enjoys camping, kayaking and decorating old funiture. Dee was receptionist here for almost five years before going on a once in a lifetime, yearlong adventure with husband Phil - a motorcycle journey from Argentina, travelling though all of South and Central America to the USA! Luckily for us Dee moved back to the area after her trip and returned to Wangford Vets to cover colleague’s holidays, and the rest as they say is history, we persuaded her to come back on a permanent basis. Now living back in the area Dee, soon found she needed another dog in her life and gave a home to 8 year old Purdy who came from Southern Lurcher Rescue.